The stage-coach service to and from Southwold was erratic in the early 19th century, always struggling to make a profit. James Martin, landlord of the Red Lion started a very basic, open 'Wain' service to Norwich and back in about 1820. Henry Foyster took it over in 1826, picking up custom from the main stage-coach service which had ceased that year. In 1828 a new 'proper' coach service to Nowich, known as the ’Pilot’ started up. But it only operated in the summer. In the winter, just when passengers would have appreciated a bit of cover and comfort, they had to revert to the open wain service. Iin 1830 the ’Old Blue’ coach provided a service to Halesworth, Saxmundham and London. The same year the ’Shannon’ also ran but only for six weeks. Both stopped operating in October of that year because of a lack of trade . People had to wait another 14 years before there was a stage-coach service again. 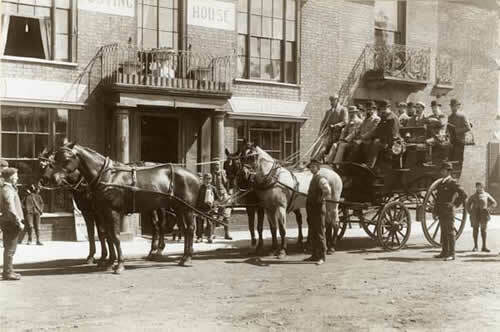 In 1844 a summer- only service from the Crown Hotel ran to Norwich and connected with the London coach at the Angel Inn at Wangford. This survived until 1850. Competition was fierce, not only with other coach operators but also with the burgeoning railway system which had expanded across Suffolk in the 1840s. As a result, long-distance services were discontinued and operators focused on services to rail heads. In 1847 a Mr Elliot started a coach running from the Crown Hotel daily to Lowestoft returning in the evening. In 1849 he also ran a ‘Fast Omnibus’ three days a week from the Red Lion in Southwold to Beccles to connect with the Norwich trains. On the other three days it connected with Moore’s Railway Bus to Haddiscoe (on the Norwich/Lowestoft line) which operated until the1850s. A railway from Halesworth to Ipswich opened in 1859. In 1860 Mrs. Catton ran a public omnibus service from the Swan Hotel to Darsham railway station which continued until the Southwold Railway opened in 1879.